There is a small problem in my house: my husband does not like tomatoes. Sure, he'll eat tomato sauce, but do not try to serve that man a tomato and mayonnaise sandwich; in fact don't even eat it in front of him. Though he helped plant 16 tomato starters in our vegetable garden this year and has lovingly weeded them, pruned, and nurtured them. He still refuses to eat a ripe, perfectly seasoned, raw tomato. And I refuse to make dinner twice. 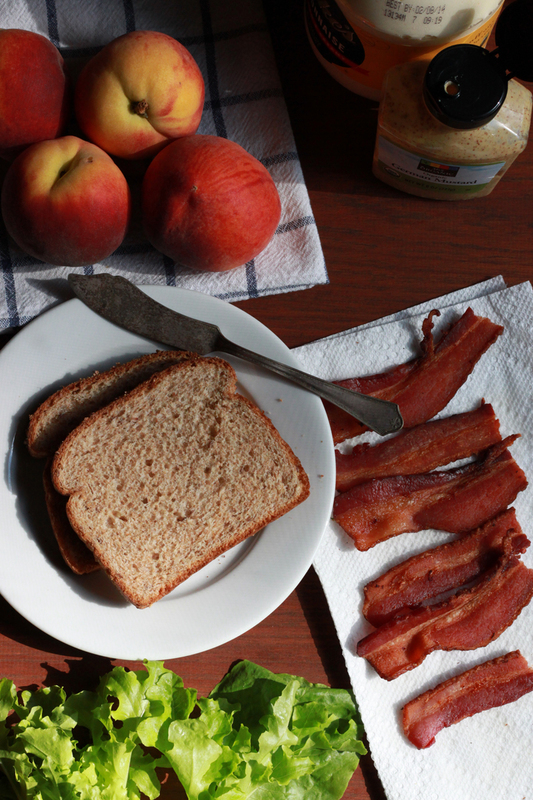 We've found a brilliantly simple solution for the nights when I want nothing more than a juicy, crunchy, smokey, sweet BLT. 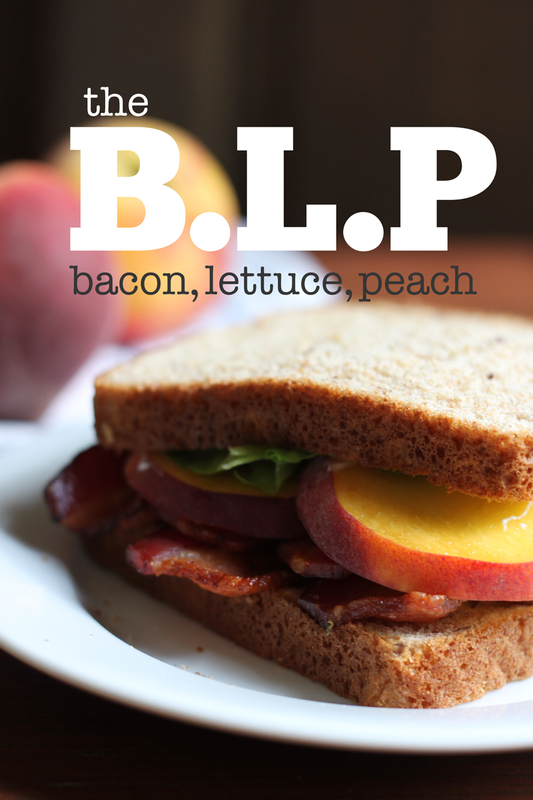 May I introduce you to the BLP - the bacon, lettuce, peach sandwich. This sandwich may be the salvation of easy summer suppers in the Splawn house. 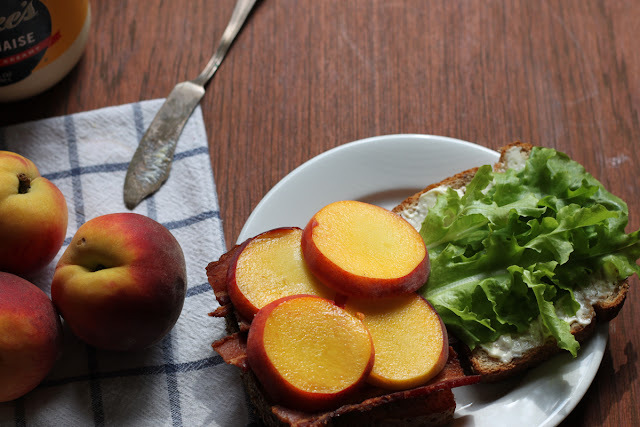 A nice ripe peach, sliced thickly and sprinkled with salt and pepper is about as satisfying as any heirloom tomato you've eaten so far this summer. Paired with smokey bacon, crisp lettuce, and a hearty smear of tangy mayonnaise - you won't even miss that tomato. Slather one slice of bread with mayonnaise, the other with mustard. Stack the bacon on top of one slice of bread. Top with the peach slices and season with salt and pepper. Top with the lettuce, followed by the remaining slice of bread. Devour. I LOVE this combination, it's brilliant! .. My grandma puts bacon jam and peaches on her biscuits. Bacon, peaches, and biscuits are a damn dream team! I also don't eat raw red tomatoes, but I LOVE a fried green tomato BLT. I can't even imagine peaches with mayo and mustard but I would be willing to try it. I bet those sweet Georgia peaches are amazing paired with bacon! As I tell my daughter - "just try it - you might like it"! Your husband and I have a disdain for tomatoes in common. I love tomato sauces and restaurant-style salsa, and I have two tomato plants growing right now, but I cannot stand a raw tomato or even one that is semi-intact in a sauce or salsa. I'm meh on peaches as well, but I will have to try this one! I think its a texture thing for him with tomatoes - something about the fleshy feeling of it - so I was surprised he liked the peaches. You could try another fruit too, my sister-in-law loves thinly sliced apple and bacon. I'll have to try grilling both the bacon and the peaches - that sounds amazing!